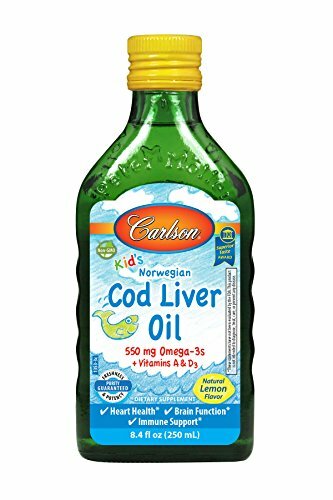 Carlson for Kids Norwegian Cod Liver Oil liquid in lemon flavor has received numerous awards for its taste and quality. A single 1/2 teaspoon provides 550 mg of omega-3s, including EPA and DHA, which support heart, brain, vision, and joint health. To ensure maximum freshness, Kid's Cod Liver Oil is closely managed from sea to store. We source the highest quality Arctic cod off the coast of Norway using traditional, sustainable methods. The same day they're caught, our cod are transported to a highly regulated Norwegian facility for processing and purification. Kid's Cod Liver Oil is bottled with a touch of vitamin E and air is removed to prevent oxidation. It's then delivered to us and is tested by an FDA-registered laboratory for freshness, potency, and purity. Help your kids get the omega-3 nutrients their growing bodies need for optimal health. 550 MG OMEGA-3S: A single teaspoonful provides 550 mg of omega-3s. Vitamins A and D3 are also found in Cod Liver Oil.